This an interesting example where an instrument has been adapted by a later maker, presumably at the request of a customer. 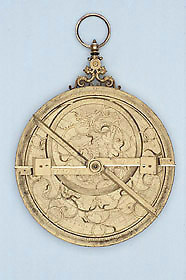 The original astrolabe, made in 1600, probably had ordinary latitude plates in addition to the surviving plate with two geographical planispheres. The engraving is very fine and the rete is delicately made. The second plate has been added by the Parisian maker Pierre Sevin, who is known to have been active between 1665 and 1683. This has a latitude projection for Paris on one side, and a universal projection on the other. Sevin has added a set of rules for using the universal projection, while the original rule and alidade also survive. Sevin's engraving, though different, is also very skilful.